Although not one of the Russian capital’s biggest monasteries, the history of the Savior-Andronikov Monastery is intertwined with that of Moscow itself. Throughout its almost nine centuries of existence, Moscow has been defined and defended by its monasteries. And although during the Soviet period they were closed with substantial losses, many monasteries and convents have survived as the city's spiritual and cultural landmarks. Among them is the Savior-Andronikov Monastery, situated to the southeast of central Moscow. Its main church, dedicated to the Miraculous Icon of the Savior, was returned to active use in 1989, but the monastery is also known as the site of the Andrei Rublev Museum of Old Russian Culture and Art, named after Russia's most revered painter of icons. Although not among Moscow's larger monastic ensembles, the Andronikov Monastery is one of the most picturesque by virtue of its location on a high bluff over the left bank of the small Yauza River. Its white brick walls, flanked by trees, are visible for some distance across the Yauza, which flows into the Moscow River nearby. The site was also at the origins of the most important route from Moscow to the east. The monastery was founded around 1360 through the initiative of Metropolitan Aleksii (ca. 1300-1378), leader of the Russian church and a figure of profound significance for Moscow's expanding political power. To get to the Savior-Andronikov Monastery get off at the Ploschadj Ilyicha subway station and then walk about 800 metres down to the Gzhelsky lane. Medieval sources recount that during a trip to Constantinople in the mid 1350s, Aleksii survived a storm at sea. On returning to Moscow the prelate fulfilled a vow of gratitude to erect a church dedicated to the Miraculous Icon of the Savior. This church, built of logs, became the nucleus of a monastery. The first hegumen (abbot) of the monastery was the monk Andronikos, a pupil of the guiding spirit of Muscovite monasticism, Sergius of Radonezh (1314?-1392). In homage to his effort the monastery acquired the dual name "Savior-Andronikov". Destroyed by fire in 1368, the original wooden Church of the Savior was soon rebuilt. Thereafter, it was replaced by a limestone structure, most likely begun in the 1420s and completed in 1427. Although modified many times, the Cathedral of the Miraculous Icon of the Savior is considered Moscow's earliest architectural monument to survive in its basic form. This structure represented an effort to revive the traditions of stone architecture in the Vladimir-Suzdal area before the Mongol invasion of 1237-38. An notable example of that style is the Cathedral of St. Dmitry in Vladimir. Although smaller than its 12th-century predecessors, the Andronikov Monastery cathedral had a distinctive silhouette created by ascending levels of pointed decorative gables, with a high drum and cupola over the center. By lowering the corners of the structure, the builders increased the vertical emphasis of this central monastic shrine. During the construction of the Savior Cathedral, the monastery was the abode of the great icon painter and monk Andrei Rublev (ca. 1360-1428). It is known that Rublev painted frescoes and icons for the cathedral, but this art has not survived, with the possible exception of a decorative painted window embrasure in the thick stone walls. Andronikov Monastery was sacked in 1571 during a catastrophic attack on Moscow by Crimean khan Devlet-Girei. It was ravaged again in 1611 during the Polish occupation of Moscow, part of the period of dynastic chaos known as the Time of Troubles. At this point it is likely that much of the early cathedral artwork was destroyed. In the course of late 18th-century repairs, the cathedral was stripped of its remaining damaged frescoes, and the interior was never repainted. The cathedral was sacked again by Napoleon's troops in September 1812 and its icon screen burned. The heat from the fire caused the collapse of the cupola and it supporting drum. A renovation of the cathedral in 1846-1850 led to the addition of north and south chapels (since dismantled), and the upper part of the structure was substantially modified. Fortunately, a careful study by Soviet specialists determined that the basic form of the early 15th-century structure (including some of its decorative gables) was intact and could be rebuilt. A restoration of the cathedral and its upper structure in the early 1960s was criticized by some, but the evidence suggests that we again have the ancient building as it originally appeared. Other notable parts of the Andronikov Monastery include its walls and towers, rebuilt in brick by the mid-17th century. (Earlier walls had been of logs.) The main entrance - the Holy Gate - was crowned with a small Church of the Nativity of the Virgin. Next to the entrance were the abbot's chambers, built in 1690 and decorated with ceramic tiles that are still visible. Unstable ground led to the partial collapse of the walls in the 1730s, and they were further damaged as the result of a fire that swept through the monastery in 1748 and destroyed most of its manuscript library. Repairs in the1750s preserved the 17th-century style of the walls and towers. The entrance to the monastery was again changed with the construction in 1795-1803 of an enormous bell tower. Built to a neoclassical design by the prominent Moscow architect Rodion Kazakov, the bell tower was 239 feet in height - only slightly lower than the Kremlin bell tower of Ivan the Great (265 feet). This landmark and the adjacent gate church were leveled in the early 1930s, with the brick salvaged for other construction. With the designation of the monastery territory as a protected cultural space in 1947, the basic walls and small towers were restored. The tallest surviving structure at Andronikov Monastery is the Church of the Archangel Michael, built over the early 16th-century monastery refectory, or dining hall. Expansion to its current form began in the 1690s under the patronage of Tsaritsa Evdokiya Lopukhina, first wife of Peter the Great. 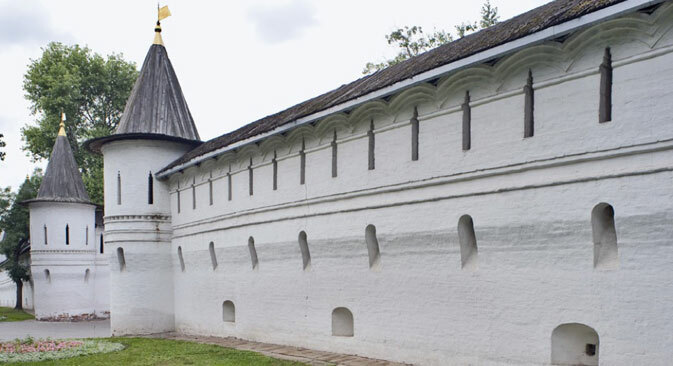 After her exile by Peter to Suzdal's Intercession Convent in 1698, construction of the church was halted, only to be completed in 1739 by the Lopukhin family, who used its lower part as a burial crypt. Although the Archangel Michael Church was severely damaged in 1812, the exterior has retained most of its original form. Closed by the bolsheviks in 1918, the Savior-Andronikov Monastery was used for workers' dormitories and other purposes until 1947, when it became a cultural landmark. After many struggles, the Andrei Rublev Museum was opened in 1960, subsequently to become a center for the study and restoration of medieval Russian religious art. It should be emphasized that the major collections of icons attributed to Rublev are displayed not here, but at Moscow's Tretyakov Gallery and the Russian Museum in St. Petersburg. The small tree-shaded park in front of the monastery is now graced with a monument to Rublev, as well as a small open chapel containing a reproduction of his best-known icon, the Old Testament Trinity. Evidence suggests that Rublev was buried on the territory of the monastery, but his grave has not been discovered. He was canonized by the Russian Orthodox Church in 1988. To the east of the walls lay the monastery cemetery, one of Moscow's historic burial grounds. Leveled in the 1920s for a soccer field, the cemetery is gradually being restored, with the addition of a chapel dedicated to St. Dmitry Donskoi. The complex fate of the Andronikov Monastery and its Savior Cathedral seems to reflect that of Moscow as a whole. This beautiful, carefully maintained ensemble should be visited by anyone interested in Russia's cultural heritage.